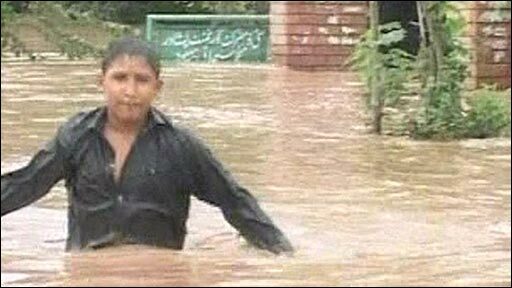 August 13, 2010 -- Pakistan must refuse to pay foreign debt and divert the amount to the relief and rehabilitation of flood-hit communities. Instead of begging for much-needed aid for relief and rehabilitation, Pakistan must stand up and announce the unilateral suspension of repayment of foreign debts, owed to international finance institutions (IFIs) and donor countries. Currently Pakistan is paying about US$3 billion on debt servicing every year. Pakistan's present foreign debt of $54 billion is increasing. This act alone can bring most of the much-need support for the immediate relief of the flood victims. August 11, 2010 -- NewsClick (India) via Real News Network -- Farooq Tariq from the Labour Party Pakistan talks about the changing relationship between the Islamic fundamentalists and the state of Pakistan. August 10, 2010 -- Tantawut Taweewarodomkun, the United Front for Democracy Against Dictatorship (UDD) USA's web designer, known as “Red Eagle”, who was arrested on April 1, 2010, on “computer crimes” and lese majeste charges, has been remanded in custody until February 2011, when the court has set a date to interrogate prosecution and defence witnesses. That means that Red Eagle will be detained in prison for at least 10 months BEFORE being tried in court. He has only just had access to his lawyer. Red Eagle has not been charged with any crime of violence or charged with committing any physical act. He is accused of looking after a website that has comments that the royalist elites do not like (see www.norporchorusa.com and www.norporchorusa2.com). 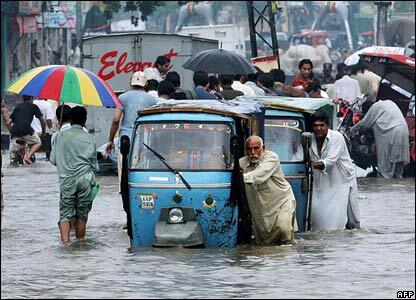 August 7, 2010 -- More than 12 million people are suffering from floods in Pakistan. Please donate to the Labour Relief Campaign to help people of Pakistan facing the worst-ever floods in its history. Torrential rains have unleashed flash floods in different parts of the country in the last three weeks. Levies have broken, leaving the people exposed to flood water. PETALING JAYA, Malaysia, August 6, 2010 -- Free Malaysia Today -- Kota Damansara assemblyman and Socialist Party of Malaysia (PSM) chairman Nasir Hashim is a realist. But he is also fond of quoting Argentinian revolutionary Che Guevara to “be realistic and do the impossible”. And Nasir is doing the impossible: he is spearheading an ambitious project to eradicate urban poverty in a small community in the vicinity of Ara Damansara, Petaling Jaya. The project has a bold vision. It will empower the poor not only by developing their skill sets but also by encouraging a mindset shift from that of victim to victor. The project also aims to have various parties – federal and Selangor governments, businesses, non-governmental organisations and local communities – working hand-in-hand to achieve this vision. It is a radical concept and one that could be seen as remarkably idealistic. Statement Solidaritas Bersama Hentikan Ancaman Terhadap Venezuela Sekarang! Kami, organisasi-organisasi di bawah ini, dengan perhatian serius melihat kemungkinan agresi militer terhadap rakyat Venezuela oleh Pemerintah Kolombia, yang didukung oleh Negara Amerika Serikat dengan menggunakan tujuh pangkalan militer yang baru-baru ini dibangun di Kolombia. Persoalan ini timbul dari kejadian belakangan ini ketika Republik Bolivarian Venezuela pada tanggal 22 Juli 2010 dituduh saat Sidang Luar Biasa Organization of American States (Organisasi Negara-negara Amerika) di Washington oleh Pemerintah Kolombia mempromosikan, mendukung dan memelihara hubungan dengan organisasi-organisasi bersenjata dari Kolombia, seperti Revolutionary Armed Forces of Colombia (Angkatan Bersenjata Revolusioner Kolombia-FARC) dan National Liberation Army (Tentara Pembebasan Nasional-ELN). Tuduhan itu hanya berdasarkan gambar yang belum pernah diperiksa ataupun diverifikasi. August 1, 2010 -- Malaysiakini -- Riot police barred activists from holding candlelight vigils to commemorate the Internal Security Act's 50th anniversary in eight places around the country. At Dataran MBPJ, Padang Timur in Petaling Jaya, Selangor -- which saw the earliest vigil begin at 8pm -- members of the police Light Strike Force (LSF) began dispersing the 300-strong crowd just as the latter began singing while marching from the mall, through the adjacent car park and towards the field across the main road. August 3, 2010 -- On February 13, 2010, Han Sang Kyun, the chairman of the Ssangyong Motor Company Union, was sentenced to four years in prison. Australia Asia Workers Links is campaigning for his release. News footage. 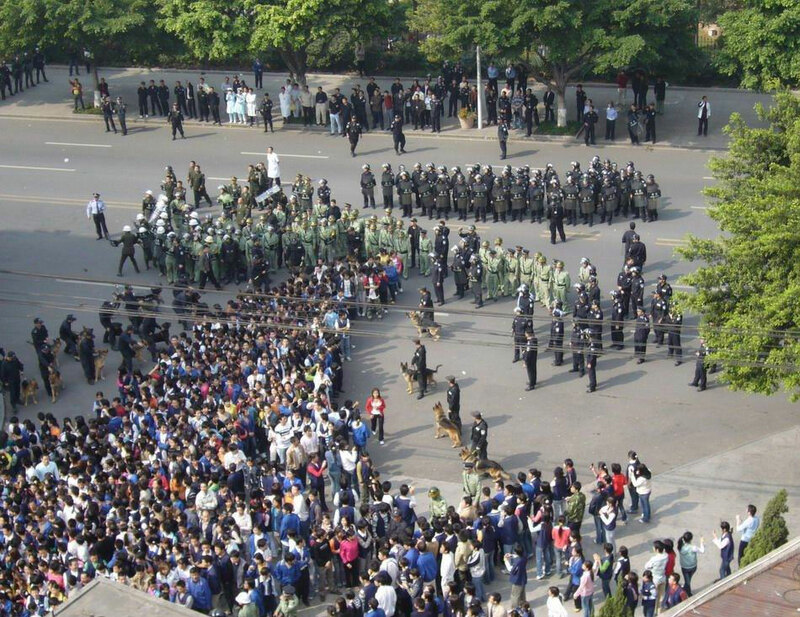 Thai regime crushed democracy protest with brute force. July 30, 2010 -- Pro-democracy movement Red Shirt political prisoners, detained by the Abhisit Vejjajiva military junta after the bloody crackdown against unarmed demonstrators in May are facing a total lack of justice with internationally recognised legal standards being blatantly ignored. This is more evidence of the total destruction of democracy, justice and the rule of law in Thailand since the 2006 military coup. Prachatai, the web-based newspaper, which the junta repeatedly tries to close down, reports that Red Shirt detainees in the north-east provinces of Ubon Rajatanee, Kon Kaen, Mahasarakarm, Mukdaharn and Udon Tanee are facing the following problems and there is no reason to believe that other Red Shirt detainees are any better off elsewhere. 1. Police evidence used for warrants of arrest is unclear and lacking in legal standards. So people have been arrested and detained under conditions where there is a lack of clear evidence. Banning the veil: Rights of women or anti-Islamic racism and communalism? July 21, 2010 -- On July 13, the parliament of France, on the eve of Bastille Day, voted 335 to one in favour of preventing Muslim women wearing a full face-covering veil in public. The July 13 Le Monde said the new law was strongly supported by the right. The Socialist Party, Communist Party (PCF) and Green Party abstained. Anyone who chooses to wear a face covering on religious grounds now faces a fine of 150 euros or a “citizenship course”. The law does not come into effect until spring 2011 to allow a period of “education”. There is also a year in prison and a fine of 30,000 euros for anyone found guilty of forcing a woman to wear a veil, a penalty which is doubled if the “victim is a minor”. Earlier this year, the Indian organisation Radical Socialist issued a statement taking up this wave of Islamophobic legislation in Europe. July 16, 2010 -- On July 6, while Mustansar Rindhawa was listening to a worker who had not been paid his wages by a textile boss, an unknown person with a Kalashnikov rifle entered the front room and fired. Mustansar tried to save his life by running to the next room. I met Mustansar Rindhawa (32) briefly on June 19, 2010, in Faisalabad, less than a month before his murder. He was one of 30 participants in a trade union leadership training course at the Labour Qaumi Movement (LQM) office. The LQM is a community-based labour organisation established in 2004. It has become the main labour organisation in Faisalabad, and is now spreading to other cities. I had been invited by the Labour Education Foundation, the organisation conducting the program, to speak on "globalisation and its impact on the working class in Pakistan". Mustansar Rindhawa and Hamid Shah were introduced to me as two newcomers to the movement. Both have been active in the small-scale industrial zone of Faisalabad. Sin Permiso -- El pasado 9 de junio el senador del Partido Liberal Benigno Aquino III, conocido popularmente como “Noynoy” Aquino, hijo de la difunta Presidenta Cory Aquino, fue proclamado Presidente de Filipinas. Su toma de posesión tuvo lugar el 30 junio, en medio de importantes ilusiones y expectativas de una ruptura con el periodo corrupto y caciquil de Gloria Matapagal Arroyo. Reihana Mohideen, una socialista feminista que coordinada la ONG filipina “Trasform Asia” ha entrevistado a tres destacados dirigentes de la izquierda socialista filipina (Frank Pascual, Sonny Melencio y Ric Reyes) para entrever la naturaleza y el alcance del nuevo periódo político abierto en Filipinas. Red Shirts' barricade prior to the bloody May 19, 2010, military crackdown. Photo by Lee Yu Kyung. 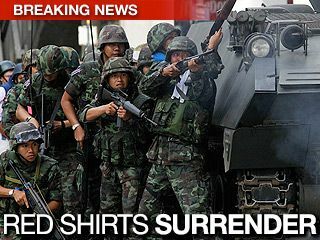 July 11, 2010 -- On July 6, the Thai government approved the extension of an emergency decree in 19 provinces, which includes many in the heartland of the pro-democracy Red Shirts in the country’s north-east. The extension came a day after the Brussels-based International Crisis Group (ICG) recommended the government immediately lift the decree and hold fresh elections. But Prime Minister Abhisit Vejajiva, who came to power through the army’s intervention, crushed hopes for new elections weeks ago. There have been tireless efforts to silence critical voices before and after the bloody crackdown on the Red Shirts in May. The International Crisis Group said in a July 5 report that more than 2200 websites have been shut down for alleged violations to the Computer Crime Act since the state of emergency was imposed on April 7. 8 Juli 2010 -- Berdikari -- Aktivis partai Aliansi Sosialis (Socialist Alliance – SA) di Australia menolak rencana PM Julia Gillard untuk membangun pusat pemrosesan suaka regional di Timor Leste. Kandidat SA dari Perth, Alex Bainbridge, menggambarkan bahwa rencana menampung pencari suaka Australia di Timor Leste bukan didasarkan atas belas kasihan dan keadilan, sebagaimana dikatakan oleh PM tersebut, melainkan untuk mendorong pemenjaraan lebih banyak lagi. “Kebijakan yang sesungguhnya kita butuhkan adalah yang berdasarkan belas kasihan dan rasa keadilan – yakni menempatkan mereka di tengah-tengah komunitas [masyarakat] Australia,” kata Bainbridge. “Fakta sederhananya, pemenjaraan adalah pemenjaraan – apakah pemenjaraan itu di Pulau Christmas atau Leonora, Timor Leste atau Nauru,” tambahnya. China: In who's interest does the state serve? Striking workers at the Tianjin Mitsumi Electric Co Ltd factory in the city of Tianjin, June 29, 2010. July 2, 2010 -- Workers' Compass -- The recent wave of strikes in China, most visibly at Honda factories, are testament to a growing movement of labour unrest in the country. This development is of great importance for international working-class struggle. For the capitalists, China holds a key position in the global system of generating profits. The demands of China's workers for better conditions and a higher standard of living are in direct conflict with the international capitalists' desire to use China as a source of cheap labour. For the world's big business elite, already shaken by an international economic crisis of their own making, the growing militancy of China's workers is a great threat. June 30, 2010 -- Three months' notice has been given to Punjab government to decide the fate of the 68,000 acres of agriculture land owned by Punjab government and cultivated by tenants for more than 100 years. The tenants have been demanding land ownership rights. Despite promises to do so by former prime ministers Benazhir Bhutto and Mian Nawaz Sharif, the land in question has not been allotted to the tenants.